The Aquaquik Pump and Filter system is designed to handle the filtration needs of many of today's popular blow-up and metal framed above ground pools such as Intex, Bestway or the Walmart Sand N' Sun brand. It provides an efficient, easy to use, simple to install and operate system that will keep pool water clean and sparkling. Sand filtration means no more flimsy cartridges to continuously buy. This system cleans up to 10 times faster than your standard type cartridge filter that comes with these type pools. Click here for a Aqua Quik Owners Manual. Self-Priming 1/2 HP Pump with Hair and Lint Strainer. 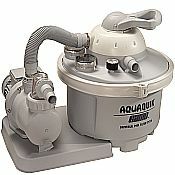 For pools up to 15,000 gallons. Includes 1.5" & 32 mm hose fittings. Includes 2 1/4" adapters for Intex type pools. 41 Gallon Per Minute Flow Rate. Holds 38 lbs of sand.